The best part of this year were the relationships! We were blessed to partner with missionaries in Thailand and Myanmar. Seeing how they serve The Lord has impacted us in a great way. I loved teaching The Gospel to the 4 year olds in Myanmar. Seeing how Christ captivated their hearts at a young age captivated me. I also learned some life lessons from some of those kids and I'm truly grateful for that. Our prison visits put us face to face with some of the most transformed and deep Christians I've met. We were also so blessed to meet people in the ministry who were once in the prisons. I'll never forget sitting at dinner with a missionary in Cambodia who told us that Buddhism does indeed have some good teachings but that only Jesus Christ can change your heart. Dave and I were so so blessed to have people visit us in Asia. It did our hearts good and God sent them at the exact right time. People back home! I'm so grateful for the team of support we had at home: family who was 100% for us, people who faithfully prayed for us, friends who would vox me daily to see how I was, friends who commented on the blog or who would e-mail me to see how I was doing and so much more. That was a gift from God that helped me make it through this year successfully. I'm really grateful for the year I had with Dave. Living abroad isn't perfect and easy but it did our relationship a lot of good and we got to build a lot of memories together and most importantly we got to serve The Lord side by side and that is a huge gift. I'm grateful for my relationship with Christ. I come short time and time again but each time I do His love and grace is bigger. I'm thankful He put us in a place where we had to depend on Him more and where we had the gift of time to spend with Him. Travel was a big part of our year too! Dave and I visited a total of 6 countries and 4 US States. 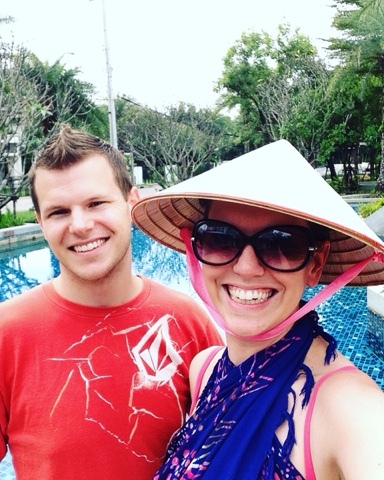 We spent approximately 3 months in Thailand, 9 in Myanmar and 1 month was for traveling SE Asia. The two places that come to my mind as my 'top favorite' are Krabi and Singapore. Krabi, in the photo above, was just purely magical. You could only access the island by boat and it was full of hiking, snorkeling, sunsets, kayaking, good food, monkeys and cliff jumping (for Dave at least). 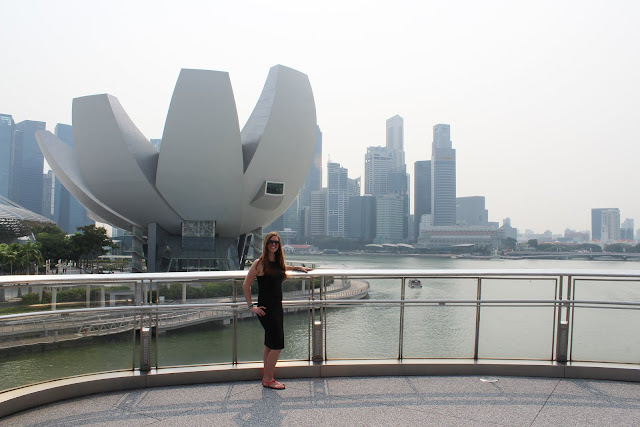 Singapore was by far my favorite travel spot in SE Asia! After living a year in Myanmar the futuristic, overly clean and organized city island of Singapore did my heart some major good. Flowers also somehow must be in my recap for 2015 because they were all over and everywhere in my life in SE Asia! Lastly, HOME! We made it home in early December and got to see all our family and meet two new family members. There are no words to describe that feeling! So so good! I hope your 2015 was one that counted. I know not every year is easy and wonderful for each person but I hope that no matter what this year brought you that you saw God's faithfulness each step of the way. What was a favorite moment or lesson from 2015 for you? What are you most looking forward to about 2016? I'm glad your marriage relationship grew this year and that you were able to successfully make it through the year! I'm so glad you had people come visit you. I'm sure that was a blessing. I wonder how you will ever top your epic year of traveling! You will shine a light for Jesus wherever you go, that's for sure, friend. I hope we can meet up this year at some point! What a crazy-full year you had! It's been so great getting to follow along as you share the lessons this year has taught you...I can't wait to see where 2016 takes you guys! Hey! We were just in Singapore over the weekend! Walked right past the ArtScience Museum in the photo behind you! You guys sure had a year that was both amazing and challenging!